Special Announcement: Master Zhou is the only teacher qualified to teach his system of Tian Jue Qi Gong. There is no teacher's training certification in his style of Qi Gong, and there are currently no practitioners in the US or internationally who are certified or have been approved to teach Master Zhou's Tian Jue Qi Gong, anywhere at any time. Any advertisements claiming otherwise by practitioners saying they are certified or approved directly by Master Zhou to teach his Tian Jue Qi Gong forms are false. Master Zhou provides Martial Arts training and Medical Qi Gong treatments in the El Monte neighborhood of Los Angeles, California at the Tian-Jue Qi Gong Non-Profit Foundation and School. Individual treatments and private Tian Jue Qi Gong and martial arts training are available several per week, and group classes are available on Sundays at 1pm, all by appointment. More details below. All martial art forms include 3-4 minimum private training sessions with Master Zhou. Form reviews are available at an additional charge. All classes and healing treatments are payable by cash or check only and are non-refundable. Please call: (310) 478 1798 for current class tuition, registration and schedules, to schedule treatments or private classes, and for more information. 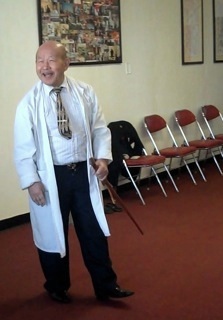 Check out this article about Master Zhou, at NBC's Go Healthy New York! It is the opportunity of a lifetime to learn from a Grandmaster. Master Zhou has been teaching Qi Gong, Tai Chi and Kung Fu for over forty years--in China, the U.S., and internationally. Over 70 years of personal practice, training and experience, including winning countless tournaments and coaching the Chinese Martial Art Olympic Teams, qualifies him to share these powerful Chinese methods of personal health care and well-being. This vast depth of experience resulted in Master Zhou creating his own system of Qi Gong, Tian Jue Qi Gong. "Tian Jue" means "Heaven and Earth." The skills and techniques of Master Zhou's Tian Jue Qi Gong can be learned by anyone, male or female, at any age, regardless of physical condition, under Master Zhou's tutelage. Master Zhou offers classes at different levels, designed to meet individual needs. He has designed a series of programs for maintaining overall health and wellness, in order to achieve the balanced and optimal state of your body which leads to an increased sense of peace and well-being. By the end of each course, each student will have completely learned the entire form and level, able to be utilized for a lifetime of personal practice. Scroll down for Course and Form Descriptions. Students may feel free to take as many consequtive Qi Gong courses as they would like, provided that they have studied with Master Zhou beginning with Level 1 and have completed the course which falls before it. (i.e. Level 2 for Level 3, and so on.) Master Zhou's Level 1 Qi Gong is a prerequisite for all students, whether beginning or advanced practitioners. Age minimum for Tian-Jue Qi Gong classes, is 15. There are no prerequisites to study Tai Chi Chuan or Tai Chi Sword. Qi Gong is not strenuous, nor does it require one to be in excellent physical shape. If you are physically challenged, you may practice and learn, in a chair. Tai Chi is more dynamic, but still not strenuous. One must be able to stand and move, to practice Tai Chi. Call 310 478 1798 for all requests, including Sunday group classes. For international or out-of-town students who wish to apprentice long term or study several consecutive forms with Master Zhou, customized private class schedules and student housing is available at the school. If interested, please inquire and arrange with the above office number or email zhoutingjue@gmail.com. Please use this email for international scheduling or long-term studies, only. All other inquiries and treatment scheduling must go through the office number. Emails for single treatment or class requests will not be answered. We do not schedule single treatments or classes through email. All classes begin promptly and exactly at the scheduled time. Please be on time and prepared, as an act of respect to Master Zhou. Bring a notebook to take notes, wear comfortable clothes and bring a water bottle for hydration, if desired. If you are physically challenged, you may practice and learn, in a chair. Class tuition is to be paid via cash/check only, on the first day of class, and is non-refundable. Call 310 478 1798 for current class schedules, tuition pricing and registration. *All of Master Zhou's classes and healing treatment fees are non-negotiable and non-refundable. Martial Arts classes and/or treatments are not available on a donation, pay-what-you-can or volunteer basis. COME TO CLASS WITH CASH OR CHECK MADE OUT TO: "ZHOU TING-JUE." ALL STUDENTS: PLEASE ARRIVE 15 MINUTES EARLY ON THE FIRST DAY OF CLASS, IN ORDER TO COMPLETE PAYMENT, CHECK-IN AND REGISTRATION. CLASSES MUST BE PAID IN FULL BEFORE THE FIRST CLASS BEGINS. Thank you kindly for your understanding, support and co-operation! Qi Gong is a powerful, effective method for treating disease and for maintaining general health and well-being. It is part of the heritage of traditional Chinese medicine, and has been practiced in China for centuries. According to traditional Chinese medical theory, every human body is a dynamic, self-contained system that is in constant interaction with the universe. “Qi” means energy, and "Gong" means exercise. Thus, Qi Gong involves working directly with a person’s life-force energies and gathering universal energies, in order to improve health. Qi, this inner energy, or power--maintains its internal and external equilibrium by moving, or “orbiting,” inside and outside the body. When the body’s Qi is moving properly and the body-system is in inner and outer balance, in a state of homeostasis, a person is healthy. Diseases and disorders occur when this inner energy is in stasis or still. The practice of Qi Gong helps to enhance the orbiting, the movement, of this inner energy--thereby bringing balance to the body. This is an optimal state that leads to the cure of disease and an increased sense of well-being. By practicing Qi Gong, a person can promote health, prevent disease, and even enhance beauty and delay aging. Qi Gong, by adjusting respiration, relaxing muscles, mind, and promoting circulation--produces benefits that are certain to increase a person’s quality of life. In its advanced levels, Qi Gong can even help people bring forth and develop various special abilities. Qi Gong is ultimately about activating and opening one's energy channels, learning to control and master one's own energy, as well as the universal energy, for Self-Mastery. *Attention: All material on this website is coprighted and cannot be used or copied without prior permission. Level 1 is the foundation of Master Zhou's Qi Gong system, and is the fastest way to collect positive energy; relax, heal, restore and recharge the body; and align and balance the Ying-Yang Energy. Level 1 Qi Gong helps to cultivate, recharge and balance your inner energy. It strengthens and purifies the inner energy and the pathways upon which this energy travels, increasing your overall health and vitality. It balances the Ying-Yang for each internal organ, and strengthens and conditions skin, joints, tendons, ligaments, and muscles. Master Zhou opens every class with a special energetic transmission to open the channels of every student to jump-start their practice of Qi Gong. In Level 1, you will learn both static and dynamic forms to absorb energy from your surroundings, Heaven and Earth, and to store it in your power centers (Tan Tiens) in order to nourish, tonify and increase your internal store of Qi (energy) within your body. The dynamic movements of the Level I form are used to move the energy collected from outside to inside of your body, so you are literally drinking life from the energy of your surroundings. Level 1 is a pre-requisite for all other levels. Level 2, Intermediate Qi Gong, teaches how to move energy in a small orbit, as well as various Qi-emitting and clearing techniques which are crucial to maintaining a balanced field; beneficial to every student, and an essential training and practice for healing and health care practitioners. In this level, Master Zhou teaches Qi Gong forms combining visualization and the mind's intention that function to clear the gates along the microcosmic orbit, so that Qi can circulate freely through the channels through the spine and the front of the body. The circulation of Qi through this orbit creates Jing (the most potent form of Qi), which increases the longevity, health and vitality of the practitioner, and purifies one's own Qi. It also creates a reservoir for excess energy, providing a safety valve for regulating the vast amount of energy that can enter the channels through Qi Gong practice. The circulation of Qi through the microcosmic orbit is the foundation for developing the medical Qi Gong healing skills of Qi projection and Qi vibration. Students learn exercises for training their ability to project Qi, vibrate Qi, and extract Qi. Qi projection is the basis for tonifying acupuncture points, meridians, and organ systems. Qi vibration is used, for example, to break up a tumor--and Qi extraction is used to dissolve it. Once the student has purified their Qi and increased their Jing to full capacity through the practice of the microcosmic orbit, he or she is in a good position to begin extending the circulation of the Qi through the rest of the eight extraordinary channels in the macrocosmic orbit (Level 3). Circulating Qi through the main governor channel, which connects the lower tan-tien and the third eye--is necessary for inner vision and thus prepares one to properly and safely open the third eye. Level 3, Advanced Qi Gong, teaches the student to move energy in a large orbit in order to reach optimal levels of awareness, self-realization and spiritual refinement. Master Zhou teaches Qi Gong forms combining specific visualization and the mind's intention, to open the crown (bai hui) and to clear and circulate Qi through the macrocosmic orbit, linking the eight extraordinary channels. This is the fundamental foundation for initiating advanced internal alchemy, becoming a Medical Qi Gong healing practitioner and/or advancing and deepening your current personal healing practice, and fully opening the third-eye. Circulating Qi through the macrocosmic orbit opens the belt channel, which makes one very energetic, requiring little sleep--and renders one's health extremely robust, and increases longevity. Master Zhou teaches a rare and unique, sacred practice that he learned from his family's Taoist lineage (Wudang Dragon Gate), which combines mantra, prayer, blessed herbs, and Qi Gong to purify one's internal energy, purge oneself of toxic Qi, and absorb pure energy. This is a practice Master Zhou has taught to only a few students and has kept secret for 21 years. He has kept it guarded because it doubles the Qi power of the practitioner who engages in it. Students receive a supply of blessed herbs for their practice, and should be prepared to engage in the practice daily for a minimum of 5 weeks (35 days)--traditionally for 7-14 weeks. It develops and deepens inner and outer, multi-dimensional vision, energetic and psychic abilities, and doubles the potency and protection of one's field. This is a very important practice if one wants to practice internal alchemy, i.e. quantum shifts on all levels, and is very valuable to healers, Medical Qi Gong practitioners, and Qi Gong and spiritual practitioners in general. It prepares and readies one's capacity to practice Supernatural Qi Gong, i.e., Levels 4 and upward, highly advanced levels of Mastery. Supernatural Qi Gong ~ Ton Lin Gong: deepens and fine-tunes your level of energy mastery, awakens and expands inner vision/third eye, which helps you to see energy visually. It is a direct path to enlightenment, self-realization and spiritual refinement. TAI CHI CHUAN...What is Tai Chi? Tai Chi represents the totality of the universe, the unity of heaven and earth, as experienced and embodied physically, within the human body. By practicing Tai Chi, one gains insight and understanding of the origin of everything internal and external. Tai Chi increases mind and body sensitivity to the self and to the surrounding environment. It enhances and supports all physical and spiritual activities. It is both an internal and external martial art form, a dynamic form that increases wisdom, energy and vitality. Whereas Qi Gong is a completely internal martial art form, i.e., its movements are used solely to gather and release energy; Tai Chi does this, as well--while also being "external," adding more dynamic physical elements such as strikes and blocks alongside more internal, elegant, fluid movements. It is a dynamic meditation. The practice of Tai Chi allows the individual to self-generate power, and imparts the ability to increase one's own energy. It is the pathway to understanding one’s true origin, and to understanding the essence of nature. It is a grounding, anchoring, centering, calming yet energizing practice. Is a specialized, advanced practice of Tai Chi which allows the participant to extend their Qi into all activities in life. The sword becomes an extension of the person's Qi, or power, and teaches the student to responsibly, safely, dynamically and elegantly extend their energy beyond the body. It is a powerful, graceful, dynamic meditation which energizes while bringing peace, clarity, confidence, protection, grounding and balance to the practitioner. Wooden practice sword is included with enrollment. Baguazhang (Chinese: 八卦掌; pinyin: Bàguà Zhǎng) is classified as one of the 'Internal' styles of Chinese martial arts, and is one of the three main Chinese martial arts taught at the Wu Dang school, the other two being Taijiquan and Xingyiquan. It is more broadly grouped as an internal practice (or neijia gong). Bāguà zhǎng literally means "eight trigram palm," referring to the trigrams of the Yijing (I Ching), one of the canons of Taoism. Xing Yi Quan (Chinese: 形意拳; pinyin: Xíng Yì Quán; Wade–Giles: Hsing I Ch'üan) is classified as one of the 'Internal' styles of Chinese martial arts. The name of the art translates approximately to "Form-Intention Fist", or "Shape-Will Fist". Xing Yi is characterized by aggressive, seemingly linear movements and explosive power that's most often applied from a short range. A practitioner of Xing Yi uses coordinated movements to generate bursts of power intended to overwhelm the opponent, simultaneously attacking and defending. Methods vary from school to school, but always include bare-handed fighting training (mostly in single movements/combinations and sometimes in forms) and the training of weapons usage with similar or identical body mechanics to that used for bare-handed fighting. The most basic notions of movement and body mechanics in the art were heavily influenced by the practice of staffs and spears.